Cynthia Warshawsky MSPA, PA-C received her Bachelor of Science from Cornell University and earned her Master of Science in Physician Assistant Studies from Seton Hall University in 2009. Upon graduation, she began working for a large dermatology practice in central New Jersey. 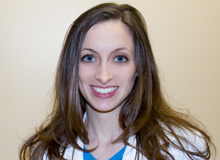 Cynthia joined the medical staff of Affiliated Dermatologists and Dermatologic Surgeons, P.A. in 2012 as a Dermatology Physician Assistant. Cynthia is certified by the National Commission on Certification of Physician Assistants and is an active member of the Society of Dermatology Physician Assistants and the New Jersey State Society of Dermatology Physician Assistants. Cynthia has a very loyal patient following and takes pride in the thorough care and follow-up she provides to her patients. To schedule an appointment with Cynthia, please call (973) 267-0300 between the hours of 7:00AM and 4:00PM. If you prefer, you can request an appointment via email by clicking Appointment Request.